R an R Luxury is a company I’ve known about pretty much for well over a year now. I don’t really remember how exactly I stumbled upon them, but I think it was on Instagram. Now that initial ‘run-in’ I didn’t really grab my attention because I was more into makeup, than skincare at the time. So fast forward a few years, I am well into skincare as much as makeup. I notice a cute little store open up just below the salon I visit regularly to get my hair and nails done, Pride and Joy. I literally walk past this store every single time I go in to the salon (which is pretty much every single weekend. Yes I am at the salon a lot. I love a good salon blowdry. What!?) and I always say “oh, I’ll pop-in on my way out”, but that just never happened until a week ago. I had a look around the store and immediately fell in love with their products. Every single thing is 100% natural from the raw sheabutter, to their body oils, black soap shampoo and even their soy-wax candles! Regular readers will know I am an absolute sucker for 100% natural skincare products, so I was in heaven! These are the products I decided to go for. I initially only purchased one of these (bottle in the middle) and a mini soy-candle. But after using my oil for a week, I knew I had to go get some more as backup. It’s the hoarder in me, once I discover something I like, I go back and get more! I mean we live in Lagos, one day the thing you love is readily available, the next it’s just not there anymore. Lucky for me, they are currently having an anniversary sale, so it’s 25% off everything in store at the moment. I actually got 3 additional bottles, but the 4th is just a second bottle of one of these shown in the picture. These luxury oils are literally Shea Butter in its oil form. I cannot for the life of me figure out how they have managed to get it to stay permanently in its oil state, but I am LOVING it! Although they do state that it could solidify in extremely cold weather conditions. Well I guess that Airconditioner isn’t classified as ‘extremely cold’ because my oil hasn’t solidified once! You all know that I love my sheabutter well whipped and buttery smooth, but this right here is ‘liquid gold’ for me! With the whipped shea, I still have to rub it between my palms to get some ‘motion’ going, but with these oils its just that much easier. It can even be used on your hair, but I am sticking to my skin with these! 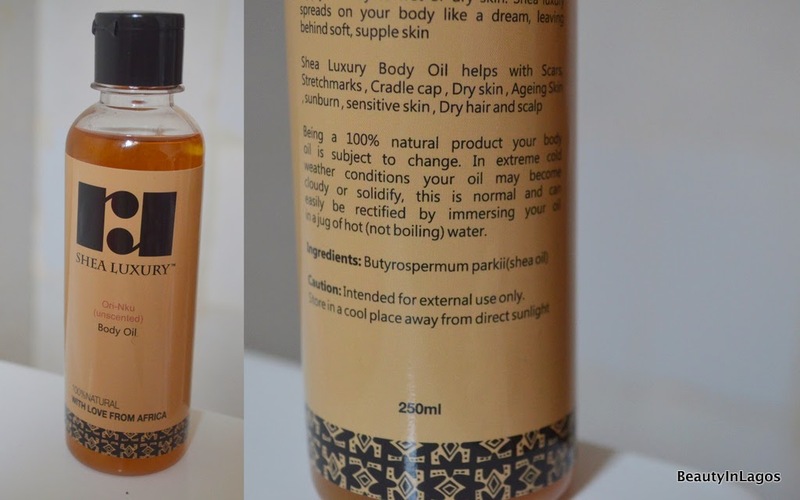 These Body Oils come in 3 variants Ori-Nku (Unscented), Lemongrass and Serenity. I had to get all three just to figure out which I love most. I mean they all contain the main ingredient, Shea butter, but with the essential oils added in, these provide just not a scent but additional benefits. With these pictures I decided to capture the ingredients. As you can see with the Ori-Nku (Unscented) Body Oil it’s just pure shea oil. All these Body Oils glide on smoothly and sink into skin. They leave my skin feeling moisturised and soft, I mean, it’s Shea butter! This contains Lemon Grass essential oil. This is actually the first bottle I picked up. The scent reminds me of the oils they use when you go to get a massage at the spa. So I just really wanted that scent on me, and it’s not overpowering, in fact, it doesn’t linger at all. I moisturise my skin with this right out the shower, and by the time I have put on my makeup and ready to head out the door, the scent is gone. This one’s called Serenity Oil. I actually asked the store assistant what was in this and she said “Serenity Oil”, and I thought what’s that? 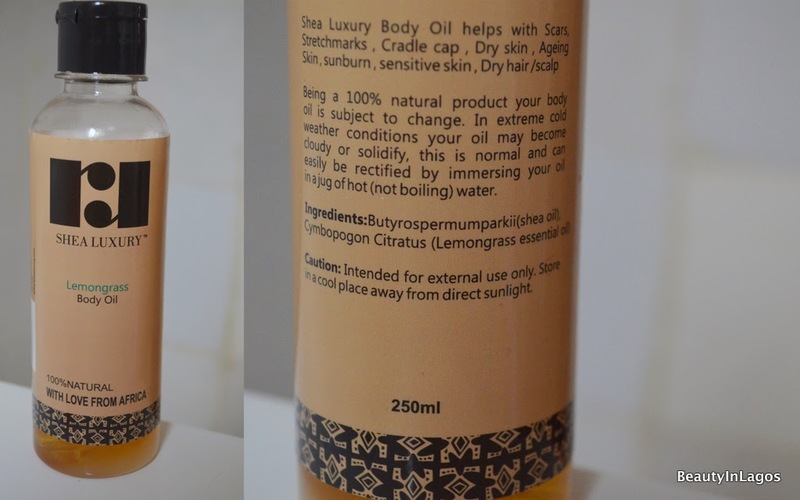 So decided to read the back to see what else was included along with shea oil to make it ‘Serenity Oil’. 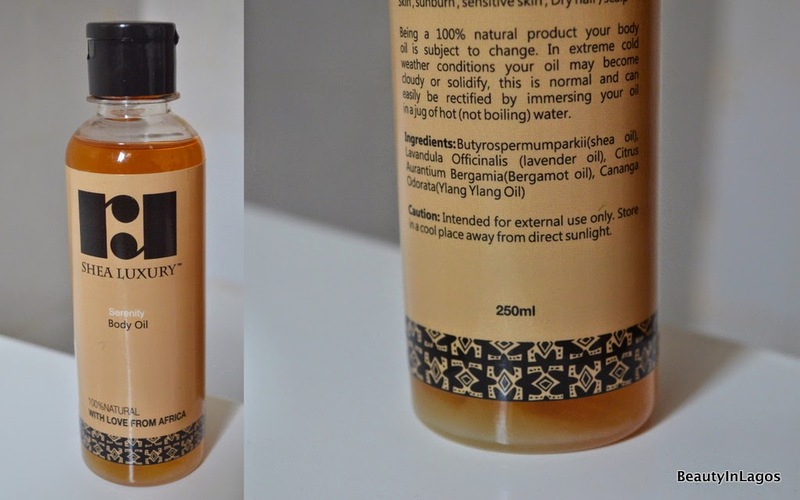 Turns out their Serenity Oil is made up of Lavender Oil, Bergamot Oil and Ylang Ylang Oil. I know Lavender oil is known for it’s calming properties. This has now replaced the Lemon Grass body oil on my vanity, I actually picked up two bottles of this! I will use this one up, then return to Lemon Grass :). This is not an in-depth review, as I have only used these oils for 2weeks now, but I love them and since I have always used shea butter to moisturize, I don’t foresee any issues to be honest. Have a look at their website to see the numerous benefits of using these body oils and also to see their full range of products. I will be going back to purchase their black soap shampoo and some candles. I really wanted to share as they are having a sale at the moment, which ends tomorrow unfortunately. But they aren’t too pricey, I mean you do get a lot of product for N2000. I am curious to see how long one bottle lasts with everyday use, I’ll be sure to provide an update on that on my Instagram page (@BeautyInLagos, you should really be following me lol). Have a relaxing 4-day weekend everyone! The products sound really good and I know what you mean about stocking up on products before you come back and they disappear, I always do this as well. Je suis interessee par l achat de vos produits. Je ne comprends pas trop l anglais mais je souhaiterais savoir comment faire pour passer commande.